Select a name. May be mixed case with numerals and underscores (e.g., CheMPS2, libefp, PCMSolver, v2rdm_casscf). Shouldn’t start with a numeral. Needn’t start with “lib”, even if a library. GitHub repository name should be AddOn_name or AddOn_name.lower() (hereafter, addon_name. For example: CheMPS2, libefp, pcmsolver, v2rdm_casscf. CMake project name should be AddOn_name. For example: project(libefp), project(CheMPS2), project(PCMSolver), project(v2rdm_casscf). Namespacing in the directory structure used to detect the addon should have this name (e.g., share/cmake/CheMPS2). Restricted by the CMake project name, add-ons return CMake variables and compile definitions of FOUND_AddOn_name and USING_AddOn_name. For example: FOUND_libefp, USING_CheMPS2, PCMSolver_LIBRARIES, USING_v2rdm_casscf. The CMake target(s) formed use the full add-on name as the namespace, AddOn_name::lib_name_without_lib.lower(). For example: libefp::efp, CheMPS2::chemps2, PCMSolver::pcm, v2rdm_casscf::v2rdm_casscf. Following the CMake project name (though not restricted to it – PSI4 managment could change the pattern), the user flag to enable an add-on is ENABLE_AddOn_name. Note that runtime-only add-ons don’t go through this enabling process. Internally, the ExternalProject_Add and dummy libraries as well as any tests/ and external/ subdirectories should all be lowercase, addon_name. The conda package and internal to PSI4 (that is, the ExternalProject_Add, dummy libraries, and any tests/ and external/ subdirectories) should all be lowercase, addon_name. Alternatively, you can do everything mentioned here lowercase and just have a different capitalization for an advertising name. After all, that’s what PSI4 does. In all cases, put Add-Ons in alphabetic order, ignoring any “lib” in the name. If there are shared resources to the external that need to be found by PSI4 in PSIDATADIR, follow the efpfrag pattern of libefp to symlink them in. No changes should be required unless both (1) code in export_* or core.cc needs the USING_AddOn_name definition or AddOn header includes and (2) no binary PSI4 module (as opposed to library PSI4 module with the AddOn target linked is itself a direct dependency of target core. Basically, try to leave this file alone, but if there are compile errors, add the definitions/headers as needed. If a module is needed to interface the AddOn to PSI4, try to put “interface” in the name. Follow the pattern of CheMPS2 or gdma. If non-required, be sure to conditionalize it with if(TARGET AddOn::addon) in CMake files or #ifdef USING_AddOn in source files. If a separate module is not required, follow the patter of dkh or simint with respect to libmints. Again, conditionalize as in preceding bullet. Add a CMakeLists.txt that imitates another AddOn of similar language and dependencies. Try to keep the format, messaging, and variables passed as similar as possible so that differences mean something. If BLAS/LAPACK or other common dependencies in psi4/psi4/common/ are needed, be sure to add them to the DEPENDS argument. The usual practice to to get everything cohesive between the CMake for the AddOn repository and PSI4 and then as a last step, mint a tag in the former and add it to two places in psi4/external/upstream/addon_name/CMakeLists.txt and one place in psi4/psi4/CMakeLists.txt so that only that version and later are acceptable to PSI4 for detecting pre-built. Create new subdirectory tests/addon_name with a CMakeLists.txt. In that add a few tests. Imitate the pattern in other subdirs of including the addon prefix to the test name in the CMakeLists but not in the test dir name. Make sure the tests get the addon CTest label and that at least one of them gets the smoke label. Create a new .rst page, copying one of the Add-Ons with similar language and dependency requirements. Edit it as appropriate. Add this page to the list in psi4/doc/sphinxman/source/interfacing.rst. Add the new page to the long list in psi4/doc/sphinxman/CMakeLists.txt. If there are any files or images referred to, add them to the file, too, following precedent. allow us to contribute some CMake files to your build system so that compile flags and dependencies (e.g., BLAS/LAPACK) can be consistent with the PSI4 build and so the installed project can be readily detected by PSI4 or any interested party (through a CMake imported target). provide us a tag at a tested commit/version number so their development may be ongoing. communicate with us when they’ve made improvements and minted a new tag. leave control of their code under your purview. maintain any interfacing code needed. regularly run integration tests between PSI4 and your code. build a mostly statically linked conda package so that any of your users can obtain a pre-built binary distribution through conda install addon --channel psi4. 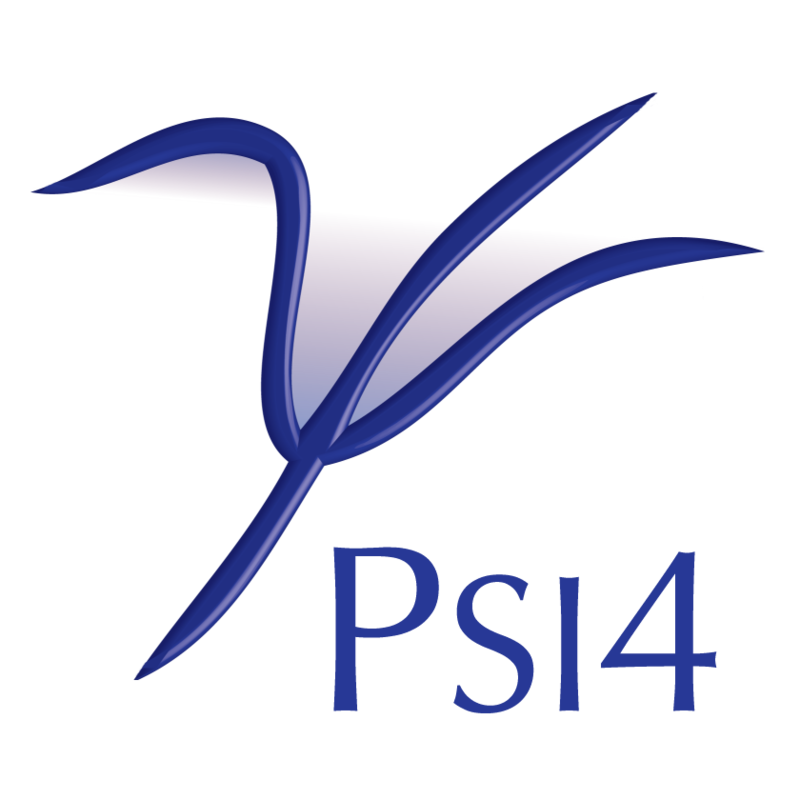 provide a development sandbox for your code through PSI4 plugins. provide conda download counts independent of PSI4. A few guidelines for standardizing option names among modules. Convergence of a method should be governed by an E_CONVERGENCE for energy and either a D_CONVERGENCE for density or a R_CONVERGENCE for residual/amplitudes. All of these should be doubles- let the input parser handle the flexible input format. Diis should have a boolean DIIS (not do_diis, not use_diis) to turn on/off diis extrapolation, a DIIS_MIN_VECS and DIIS_MAX_VECS for minimum and maximum number of diis vectors to use, and a DIIS_START which is the iteration at which to start saving vectors for diis. Not all modules conform to all these at present, but they’re as standardized as they can be without changing code. Some names that could be split into multiple words are staying as one. Use MAXITER, CACHELEVEL, PUREAM, DERTYPE. Use PRINT options to indicate printing to output file. Use WRITE options to indicate printing to another file. This probably isn’t entirely valid now but should be observed in future. The complement to WRITE is READ. PRINT, READ, and WRITE will usually be the last words in an option name. You’re welcome to use WFN and DERTYPE as internal options, but plan to have these set by the python driver and mark them as !expert options. Really avoid using JOBTYPE. You’re not welcome to add CHARGE or MULTP options. Plan to get these quantities from the molecule object. Since we frequently use subsets of systems (with their own charge and multiplicity), this is safer. Conform. Just grep 'add' psi4/src/read_options.cc to get a list of all the option names in PSI4 and try to match any conventions you find. If you have a quantity you’d like to call a cutoff, a threshold, a tolerance, or a convergence, consider the following guidelines in naming it. If its value is typically greater than ~0.001, give it a name with CUTOFF. If its value is typically less than ~0.001 and quantities being tested against the option are more valuable with larger values (e.g., integrals, occupations, eigenvectors), give it a name with TOLERANCE. If its value is typically less than ~0.001 and quantities being tested against the option are more valuable with smaller values (e.g., energy changes, residual errors, gradients), give it a name with CONVERGENCE. In deciding how to arrange words in an option name, place the context first (e.g., MP2_AMPS_PRINT, TRIPLES_DIIS). This means PRINT will generally be at the end of an option name. H in an option name is reserved for Hamiltonian (or hydrogen). Hessian should be HESS. All option names should be all caps and separated by underscores. If you have an option that instructs your module to do something not too computationally intensive and then quit, append _EXIT to the option name. Scaling terms (like for scs) should follow the pattern MP2_SS_SCALE and SAPT_OS_SCALE. For level-shifting, let’s try to have it governed by (double) LEVEL_SHIFT only and not a boolean/double combo since the procedure can be turned on (role of boolean) if the value (role of double) has changed. For Tikhonow regularization, use TIKONOW_OMEGA, not regularizer. OCC for occupied/occupation (e.g., DOCC, LOCK_OCC, OCC_TOLERANCE). COND for condition and CONDITIONER for conditioner. Use AO and MO for atomic and molecular orbitals. When ‘O’ for orbitals is too obsure or would make for too short a keyword, as in “bool NO” for “Do use natural orbitals”, use ORBS for orbitals. So natural orbitals are NAT_ORBS and Brueckner orbitals are BRUECKNER_ORBS. LEVEL (not LVL, not LEV). GEOM (not geo, not geometry). SYM (not symm, not symmetry). FILE (unless truly multiple FILES). WRITE/READ for info transfer across jobs. SAVE/RESTART for same in context of restart. Damping should interface through option (double) DAMPING_PERCENTAGE, where a value of 0.0 indicates no damping. Try to avoid COMPUTE or CALC in an option name. If it’s a boolean like “opdm_compute” for “Do compute the one-particle density matrix”, just use OPDM. Properties should be governed by a PROPERTIES array for the root of interest or by a PROPERTIES_ALL array for all roots in a multi-root calc. Since no module conforms to this right now, use PROPERTY alone and PROP in multi-part option as PROP_ROOT, PROP_ALL, PROP_SYM to conform. Use DF (not ri) for density-fitting and resolution-of-the-identity option names. Only the basis sets are staying as -RI since that’s what EMSL uses.